Quincy Preserves conducts two annual architectural tours — The Behind Closed Doors Tour and the Spring Homes Tour. In addition to our popular tours, Quincy Preserves also hosts several annual gatherings and events for both members and the public. Our annual membership dinner is the 3rd Tuesday of each March. On the third Thursday of June, we have our annual membership picnic at one of the many historic public parks in Quincy. The Quincy Preserves conducts two annual architectural tours. The Behind Closed Doors Tour and the Spring Homes Tour. 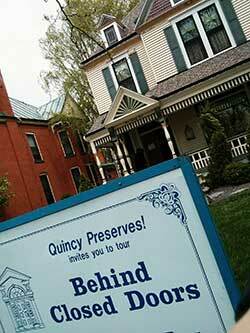 The Behind Closed Doors Tour takes place on the third Saturday in October from 10:00 a.m.- 4:00 p.m. Several homes and buildings are selected to be on this tour representing the different architectural styles found in Quincy. The new Spring to Summer Home and Garden Tour takes place June 22, 2019, and replaces the previously separate spring and garden tours. Quincy Preserves’ tours create an awareness of how fortunate Quincy is to have these many architectural treasures.